Folks shopping for a new gaming notebook with Windows 8 preinstalled have at least one option from MSI. The new GX60 is properly equipped to handle most modern PC games on respectable settings, and although it's pricier than you'd pay for a desktop equivalent, the system is more affordable than many high-end gaming notebooks. For $1,300, you get an AMD Trinity A10 (2.3 to 3.2GHz) processor, a Radeon HD 7970M graphics chip with 2GB of GDDR5 VRAM, 8GB of DDR3 1600MHz RAM, a 750GB 7200RPM HDD, a Blu-ray player and a Killer E2200 gaming NIC. Based on Notebook Check's benchmark results, you can expect very solid frame rates from the HD 7970M. 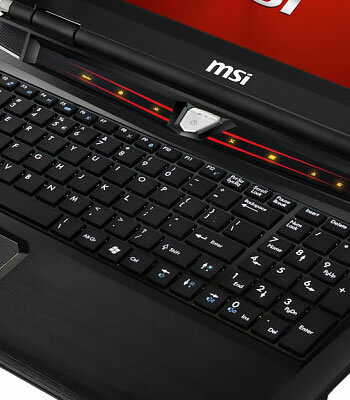 The GX60 is well-stacked externally too, packing a 15.6-inch 1080p anti-glare display, and a SteelSeries-branded chiclet keyboard, which is fairly standard among G-series machines and generally offers gaming-oriented features such as improved durability and anti-ghosting support across keys that are commonly used when playing. The specific abilities of the GX60's keyboard aren't specified, however. Other specs include a 5-in-1 card reader, a headset amp and a 2.1 THX sound system, one USB 2.0 and three USB 3.0 ports, an HDMI 1.4 output, a multi-touch trackpad, a 720p webcam, a 9-cell battery (no run time is cited) and, of course, Windows 8 64-bit. As one would expect of a gaming notebook, the GX60 is a heifer, measuring 14.97x10.24x1.77in and weighing 7.7lbs with the battery factored in.